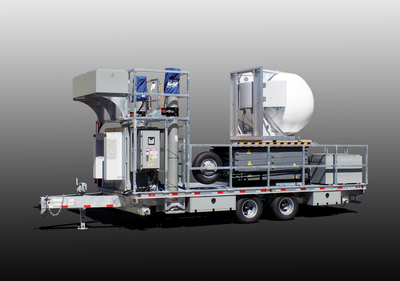 The Sun West COW - Cell On Wheels is designed to provide an industry standard platform to accommodate customer equipment and/ or equipment cabinets. Standard features include, DOT approved trailer “Manufactured by Sun West Engineering, Inc”, LED Lighting, vertically adjustable hitch, low height easy boarding deck with integrated step, Universal steel grated decking to easily accommodate mounting of all equipment requirements, fully galvanized finish, crow’s nest mast support and working platform per OSHA standards, outriggers, storage cabinets/ boxes, and a variety of pneumatic and hydraulic masts. Our COWS are configurable with many options to accommodate project requirements. Please refer to the attached drawings and full specifications. Please consult factory for special configuration options. 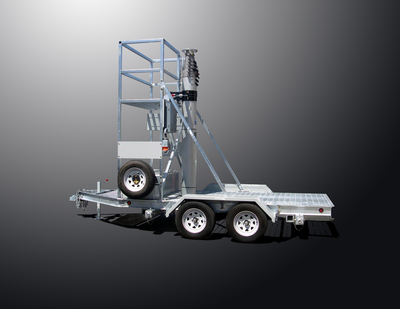 The 13’ Mini-COW - Cell On Wheels trailers are designed to provide an industry standard platform to accommodate customer equipment and/or equipment cabinets. Popular uses include small scale Tower on Wheels for water tower repaints, and special event coverage. 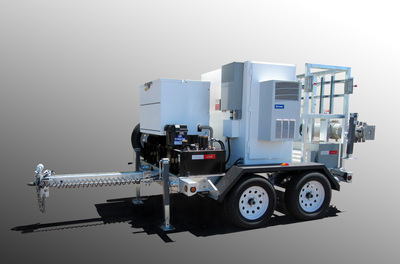 Small Cell Cow …This unit is perfect for fast set ups, and deployments that need to go through parking garages, and for those prime locations that need to fit in a mid-size parking spot (without guying). 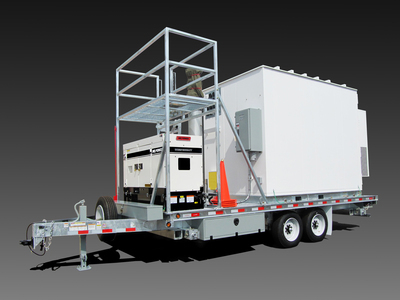 This unit’s custom compact design is for those large events that need just a little more capacity, and it’s the perfect size for disaster recovery and can be towed by ½ ton truck. The EXCLUSIVE and patented Sun West Scissor COW is here and ready to save you deployment dollars. The scissor lift COW was designed to speed the deployment of Matsing and other multi-beam antennas, while eliminating the costs associated with crane rentals at the deployment site. For example, the 500-lb 12.6 Matsing anttena can be permanently mounted to the scissor lift and can rotate 360°. The antenna can be connected to a mulit-port bulkhead to further speed deployment. 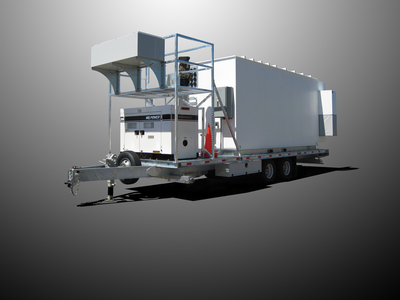 These 18’, 20' & 22’ COW Cell On Wheels trailers are designed to provide an industry standard platform to accommodate customer equipment and/or equipment cabinets. These 26’ COW Cell On Wheels trailers are the workhorse of the industry. They are designed to provide an industry standard platform to accommodate customer equipment and/ or equipment cabinets. These COWS are configurable with many options to accommodate project requirements. Please refer to the attached drawings and full specifications. Consult our factory for special configuration options. 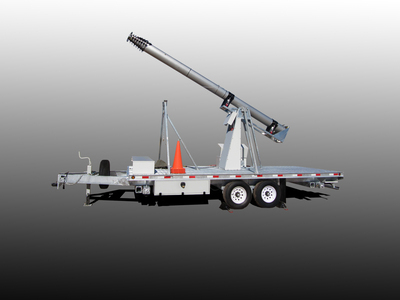 These 100’ & 120’ TOW Tower On Wheels trailers are designed to provide maximum deployable height with a mobile platform. They are available with and without generators or equipment cabinets to accommodate customer needs.